“What should we wear for our family photos?” is one of the most common questions I’ve been asked. I’ve seen ideas pulled together all over the net and find them helpful so I’ve decided to bring you a weekly post with fresh ideas that you can currently purchase. This week’s color scheme is Navy and Gray with a touch of Olive. 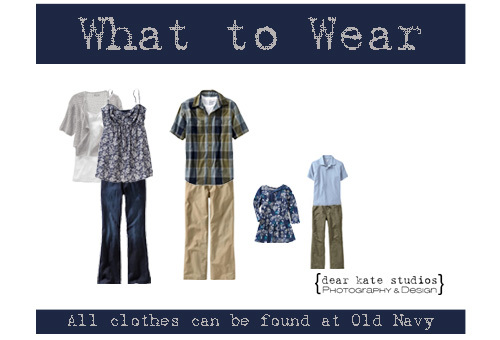 All of the clothes are currently available, in stores or online, at Old Navy. I chose Old Navy because I shop there often and the clothes are affordable. I’m open to store suggestions for future episodes of “What to Wear Wednesday” so, please comment! Not bad for dressing a whole family!